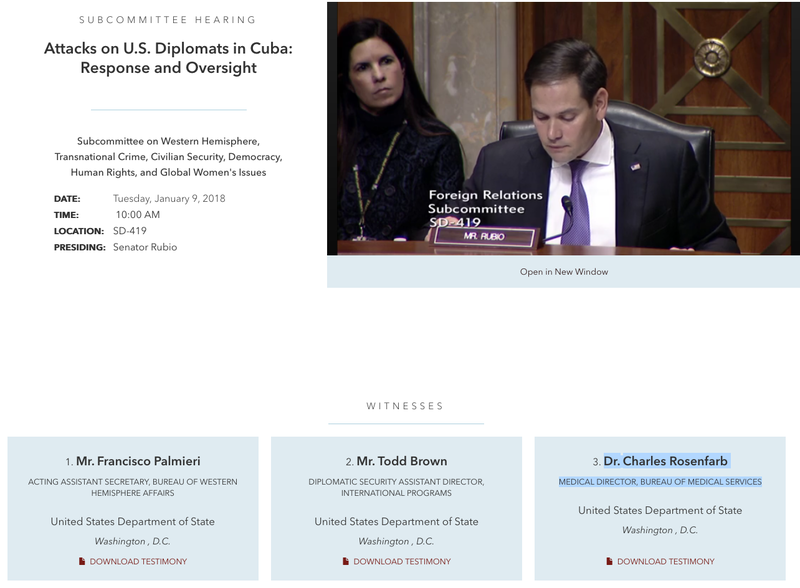 On January 9, 2018, Senator Marco Rubio chaired a meeting of the Subcommittee on Western Hemisphere, Transnational Crime, Civilian Security, Democracy, Human Rights, and Global Women's Issues entitled "Attacks on U.S. Diplomats in Cuba: Response and Oversight." It was live broadcast ( Foreign Relations here, and C-Span here). Recording of the hearing here. Some of the background and the run up to the hearings may be found here. The public portion of the hearings permitted the members to stake out their positions--from skepticism to conviction that something, of some kind, occurred an that the Cuban state might in some way be involved. This post includes a summary of the case that Senator Rubio sought to make in the Hearings and also includes, without comment, the written submissions of the three witnesses called to testify: (1) Mr. Francisco Palmieri, Acting Assistant Secretary, Bureau Of Western Hemisphere Affairs; (2) Mr. Todd Brown, Diplomatic Security Assistant Director, International Programs; and (3) Dr. Charles Rosenfarb, Medical Director, Bureau Of Medical Services. Senator Rubio obtained a consensus that people suffered injury. He then sought to determine what role there was for the Senate in that context. He then laid out his sense of the facts around Affair of the Sonic Weapons Attack, which he explained should have caused the Secretary of State to constitute an Accountability Review Board. He was informed that such a board was constituted but only on December 11, 2017 and that notice thereof was sent somehow to the Senate by the Secretary of State's office. Senator Rubio remained skeptical. He rejected the notion that anti-Castro Cubans in Miami had anything to do with the Affair as a means of destroying U.S. Cuba normalization. He was skeptical as well of Cuban denials--suggesting to him that Castro was aware of rogue elements within the Cuban state apparatus that did seek to derail U.S. Cuba normalization. The witnesses denied that any communication occurred in which Mr. Castro had ever suggested that he knew of the possible involvement of Cuban "rogue elements." Senator Rubio than raised the issue of Russian involvement; the witnesses recalled the Soviet microwave attacks in Moscow (see here) but the witnesses were careful in their answers and suggested the need to answer only in a classified setting. Senator Rubio noted the extent of surveillance of U.S. diplomats in Cuba but again the witnesses suggested any answer would have to be classified except in the most general terms. But Senator Rubio's point was to make a circumstantial case for Cuban knowledge of any attack or injury to foreigners in Havana, He asserted that it was unfair to deride the injury of U.S. diplomats in Cuba--that was "unfair." He concluded by suggesting the "we know people were hurt" and the the Cuban government knew who did it. He continued to express his displeasure with the pace and scope of State Department response. What emerges from the public portion of the hearings appears to cut in a number of directions. First, it is clear that Senator Rubio, at least, seeks to maintain media (and administration) attention on the Affair. Though eh was polite it was also clear he was frustrated. Second, it appears that senior members of the political branches are driving the Affair; the members of the bureaucracy appear to be both reluctant to take positions publicly or to push investigation in the direction of the Cuban state. Third, there is a pervading sense that lots of institutional actors have been operating on a dual track--there is a track for public consumption to which the Cuban and the American administration have devoted substantial energy (including these hearings), but there is also a sense (from the efforts to manage public opinion) that both sides have been very careful to avoiding disclosing much of what may be the rest of the story. One might guess that in this atmosphere of mutually assured destruction neither side is willing to reveal information that would expose the extent of their penetration and manipulation of each other's systems. Third, the result is this Affair is likely to continue to play out as a second magnitude public relations contest between the Cubans and the Americans, with news and media sites playing their appointed roles (given intelligence on their respective proclivities to leverage particular perspectives). Lastly, it also appears that the Affair will be most useful in justifying--for both the Americans and the Cubans--the political decisions being driven by those factions within each government that are leery of ther sorts of change normalization might require of each side. Senator Rubio noted that the record of the hearing would remain open for several days to establish a record of questions to be asked and hopefully answered by relevant Administration officials. For reporting on the event see HERE with links. Chairman Rubio, Ranking Member Menendez, and distinguished members of the Committee: thank you for the opportunity to speak about the attacks against U.S. diplomats in Cuba and the Department of State’s efforts in response. At the outset, I want to thank you for your concern for the safety and security of our diplomatic personnel in Havana. As you know, that is Secretary Tillerson’s top priority. It is mine as well. I am pleased to be here today with my colleagues from the Bureau of Diplomatic Security and the Bureau of Medical Services, with whom the Bureau of Western Hemisphere Affairs has worked closely on this complex issue. I would also like to emphasize up front that the investigation into these health attacks is ongoing. I understand that there are ongoing discussions within the committee regarding this matter, and the fact is, there is still much we do not know, including who or what is behind the injuries to our personnel. We have the best experts in the government and the private sector working to help us understand it. At every step in our response to these events, we have worked closely with our medical and technical experts in evaluating health conditions and the nature of the attacks. I will walk you through a general timeline, which will describe our diplomatic engagement with the Cubans on this issue, and review many of the actions we have taken to date. Then, I will defer to my colleagues to address the security and medical issues. In late 2016, some members of our diplomatic community serving at U.S. Embassy Havana complained about hearing strange noises and a variety of unexplained physical symptoms. As the Department investigated, we began to see signs suggesting that these events – initially in diplomatic residences, and later, at hotels – may have begun as early as November 2016. As soon as we identified a pattern connecting these unusual events with certain health symptoms, U.S. officials approached the Cuban government in mid- February to demand it meet its obligations under the Vienna Convention to protect our personnel. The Cubans denied involvement, offered their cooperation, and opened their own investigation. Since then we have engaged the Cubans more than 20 times, from the working level to the highest level of the Cuban government, both here in Washington and in Havana. Separately, we launched a government-wide effort to find the cause and culprits behind these attacks. Apart from the investigation, we have met with U.S. interagency partners more than a dozen times to discuss and refine our response to these attacks. The attacks initially appeared to occur in clusters, but starting in late March, sporadic attacks continued until late April and then seemed to stop. Beginning in mid-April, we allowed anyone serving at Embassy Havana who did not feel safe at post to return to the United States. We also expelled two Cuban diplomats in May in order to underscore the Cuban government’s responsibility to protect our personnel. After a period without any attacks, there were two additional attacks reported in close proximity in late August, which were medically confirmed in September. Based on the resumption of these attacks, Secretary Tillerson ordered the departure of non-emergency personnel from post on September 29. The Secretary assessed this was the only way to significantly reduce the risk to our diplomats and their families. As a follow-on to the Ordered Departure decision, we expelled 15 more Cuban diplomats in October to ensure equity in the impact on our respective operations and to underscore to Cuba its obligation to stop the attacks. These decisions – both to draw down our personnel at Embassy Havana and to expel Cuban diplomats – did not signal a change in policy. Prior to the Secretary’s decision to institute Ordered Departure, our Embassy held 17 town hall meetings with American staff. Since the return of U.S. diplomats to Washington, we have held a number of meetings with them. Secretary Tillerson personally met with these evacuees to explain his decision to institute Ordered Departure, and we have organized a number of meetings to address evacuees’ concerns. The well-being of the 24 confirmed victims, as well as the well-being of all of our evacuees and those remaining in Havana, continues to be our priority, as does the ongoing investigation. With that, I will turn it to my colleagues to discuss their areas of expertise. Then I will be happy to answer your questions. Good morning Chairman Rubio, Ranking Member Menendez, and other distinguished members of the Committee. Thank you for your invitation to appear today to discuss the health attacks involving U.S. diplomatic personnel and their families in Havana. Along with my colleagues, I share your concerns regarding the safety and security of our personnel in Cuba, and welcome any discussion that may lead to a better understanding of this issue and stronger safeguards for our employees. From a security and investigative standpoint, we continue to work with Embassy Havana to aggressively counter, mitigate, and better understand who and what are causing injuries to our diplomatic staff. Unfortunately, this remains a perplexing case. Our Regional Security Officer at Embassy Havana first became aware of potential health attacks involving Embassy personnel in late December 2016. In the early stages of trying to understand what may have been occurring, Post leadership and supporting offices in Washington believed it was likely a form of harassment by forces hostile to the United States and our presence in Cuba. As more incidents were reported in early 2017 and greater awareness of the seriousness of symptoms became known, our level of concern and mitigation efforts rose exponentially. After senior level meetings with Cuban officials in February outlining Cuba’s responsibility to protect diplomats under the Vienna Convention, the Regional Security Officer received confirmation from Cuban counterparts that the Cuban government was conducting its own investigation into the matter. Senior U.S. officials on Embassy Havana’s Emergency Action Committee met frequently as part of our ongoing attempt to better understand the nature of the apparent attack and protect staff. Among other things, the Embassy deployed recording devices in staff residences in an effort to better identify or capture the possible source behind the threat, as many victims had associated the attacks with an acoustic event. After further investigative attempts and expert analysis failed to identify the cause or perpetrator, the Federal Bureau of Investigation opened a case in early May. An FBI team has since visited Havana several times and met with Cuban officials. The FBI’s investigation has interviewed victims and conducted surveys of the residences and hotel rooms. However, the investigation remains ongoing and we would refer all specific questions concerning the investigation to the FBI. Thank you. I will be glad to answer any questions you may have. TESTIMONY OF CHARLES ROSENFARB, M.D. Thank you for the opportunity to testify on the Department’s response to the recent health attacks in Havana. I will be describing the evolution of the medical response and what we currently know about the health effects. From the individual and public health perspective, managing this evolving situation is challenging. Mission personnel describe a multitude of symptoms, many of which are not easily quantifiable and not easily attributable to a specific cause. The sharing of information that occurs in a small, tight-knit community has helped identify more affected personnel, but, as typically is the case with any community outbreak, also can complicate an epidemiological investigation. However, the most challenging factor is the lack of certainty about the causative agent and, therefore, the precise mechanism of the injuries suffered. symptoms to their exposures with unusual sounds or auditory sensations. Various descriptions were given: “a high pitched beam of sound”; an “incapacitating sound”; a “baffling sensation” akin to driving with the windows partially open in a car; or just an intense pressure in one ear. Since the symptoms first reported primarily affected auditory functions, an otolaryngologist at the University of Miami, highly experienced in evaluating acoustic injuries in military personnel, was identified to perform additional assessments. Between February and April of last year, this specialist evaluated eighty members of the Embassy community. Of the individuals evaluated in this initial tranche, sixteen were identified to have symptoms and medically verifiable clinical findings of some combination similar to what might be seen in patients following mild traumatic brain injury or concussion. In early July, my office convened a panel of academic experts to review the case histories and the test results gathered to date. Although the assembled group identified that some of the symptoms and findings could be caused by other things such as viral illnesses, previous head trauma, aging, and even stress, the consensus was that the patterns of injuries that had so far been noted were most likely related to trauma from a non-natural source. In light of the emerging clinical parallels to mild traumatic brain injury, the nationally-recognized brain injury center at the University of Pennsylvania was identified to provide detailed reevaluations of employees with prior exposures and to evaluate Embassy community members who reported new exposures. As a result of further evaluations begun in late August, additional individuals with exposures that occurred prior to April 24 were added to the list of confirmed cases. Two other individuals who reported exposures that occurred in mid-August 2017 were also medically confirmed as cases, bringing the total number of cases to 24.
disorientation; nausea; and extreme fatigue. In many of the patients, the acute symptoms resolved within days to weeks, but other health issues emerged that were more persistent. These have included: cognitive problems, including difficulty with concentration, working memory, and attention; recurrent headache; high-frequency unilateral hearing loss; sleep disturbance; and imbalance walking. As in the acute phase, the duration and severity of these later symptoms have varied widely. Defining the prognosis for the confirmed cases is extremely difficult since no precise analogue for this possibly novel syndrome exists. Some patients remain symptomatic months after their exposures. The persistent symptoms have improved to varying degrees in all individuals, some after extended rehabilitative therapy, some over time without treatment. Ten of the 24 patients have returned to either full or part-time work, while others continue to receive treatment with an anticipation of return to duty. However, at this time we are unable to state whether or not the injuries may result in adverse long-term consequences to the individuals’ future health or functional abilities. All government personnel who travel to Havana on official duty now receive a detailed medical briefing and are encouraged to undergo pre-deployment screening including baseline audiograms and neurocognitive testing. We have formally requested assistance from the Centers for Disease Control for performing a broader epidemiological analysis and providing appropriate medical information to the American public. Discussions have also been held with the National Institute of Neurological Disorders and Stroke at the National Institutes of Health regarding its participation in the ongoing medical investigation.